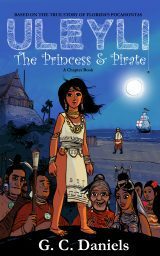 Uleyli- The Princess & Pirate: Based on the true story of Florida’s Pocahontas. This children’s story is a retelling of a Spanish legend about a young Native American woman named Ulele who lived possibly in Tampa Bay, Florida around the year 1528 who rescued a teenage Spanish captive by the name of Juan Ortiz from execution by her father, Ucita, the village chief. 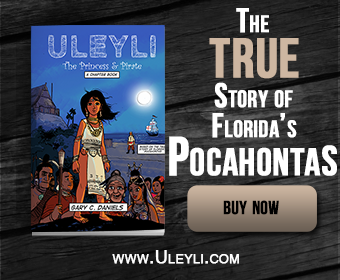 Ulele and Juan Ortiz have become known as Florida’s very own Pocahontas and John Smith except their story takes place 90 years before Jamestown was founded. Learn more about this fascinating Native American woman in this work of historical fiction for kids available in two separate editions: a chapter book & junior graphic novel. The Chapter Book is a 94-page book with black and white illustrations for young readers in grades 1-3 (ages 6-9). The Junior Graphic Novel is a 34-page book with full-color illustrations for young readers in grades 4-6 (ages 9-12). 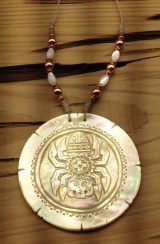 Spider Shell Gorget. This beautiful necklace features a spider design hand-carved into gold mother-of-pearl seashell by Creek artist Grady Smith. 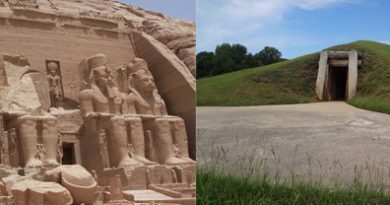 The design is based on similar shell artifacts unearthed by archaeologists throughout the Southeastern U.S. dating back over 1000 years. This design is also featured in the children’s book Uleyli- The Princess & Pirate. 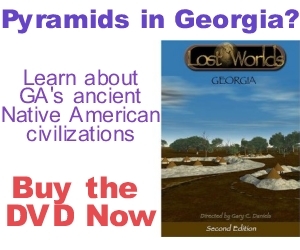 Lost Worlds: Georgia (DVD) This award-winning documentary takes the viewer through 4,000 years of Native American civilization in the state of Georgia. 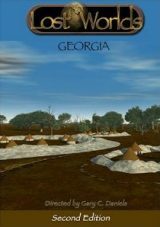 It features interviews with experts, animated 3-D reconstructions and digital video footage of some of the most important Native sites in Georgia including the Sapelo Shell Ring site, Rock Eagle & Rock Hawk effigy mounds, Fort Mountain site, Kolomoki Mounds, Ocmulgee Mounds, and Etowah Mounds. 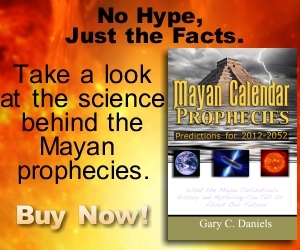 Mayan Calendar Prophecies- Predictions for 2012-2052. 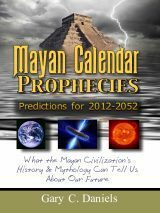 This non-fiction book attempts to debunk the hype surrounding the so-called “end” of the Mayan Calendar and reveals what the Maya actually predicted, in their own ancient books, about civilization’s future. It also reveals the shocking origins of Kukulkan, the Feathered Serpent “deity,” who the Maya claimed gave them their calendar and taught them the arts of civilization after a global cosmic catastrophe. Our Gift Shop features our exclusive Native American artwork and designs on a variety of products including t-shirts, coffee mugs, mouse pads, stickers, buttons, postcards, posters, framed artwork and more.